Americans for Legal Immigration PAC is calling on GOP lawmakers to remove minority leader Kevin McCarthy (R-CA) and the third-ranking Republican Liz Cheney (R-WY) from their leadership positions for allying with Democrats at The New York Times to smear Rep. Steve King with false accusations of racism. Kevin McCarthy is on ALIPAC's "Cantor List" and has his own Amnesty Supporter Profile (View) for his open advocacy of Amnesty for illegal aliens, and Rep. Cheney is being added to the list today for joining liberal Democrats to smear Rep. King, who is on the left's hit list for his successful efforts stopping Amnesty legislation in the US House. Rep. King recently came under fire after making the mistake of conducting an interview with the very biased Democrat-run New York Times without recording the interview. 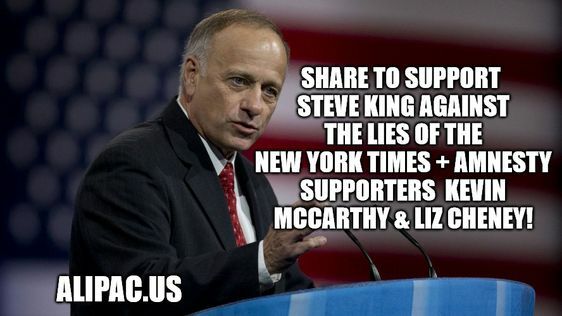 The New York Times then took King's comments out of context to falsely smear King as a racist. Rep. Steve King is often falsely accused of racism because of his fierce opposition to illegal immigration, open borders, and Amnesty legislation. "We want our illegal immigration and Amnesty fighting activists to make every effort to warn American news consumers that Rep. King did not express any racism or doubts that the term "white supremacist" is offensive. This contrived and manufactured media fire-storm is a another false smear campaign like the many we saw aimed Donald Trump and Judge Roy Moore," said William Gheen, President of ALIPAC. "By siding with socialist Democrats in the media to engage in such disingenuous and malignant lies against a fellow Republican, the pro-Amnesty lawmakers Kevin McCarthy and Liz Cheney have proven they are an asset to their fellow liars the Democrats in legislative and electoral matters. As such, we call on Republicans who value truth, integrity, and party loyalty to remove McCarthy and Cheney from their positions before they join Democrats to smear another innocent American defender like Rep. Steve King." ALIPAC has endorsed Rep. Steve King for many years due to his thoughtful, vocal, and non-racist support for America's existing border and immigration laws. Rep. Kevin McCarthy is on ALIPAC's "Cantor List" due to his support for Amnesty for millions of illegal aliens which would, in turn, create a permanent monopoly for socialist Democrats over US elections and all branches of government. For more information about illegal immigration and how publications like The New York Times and news wire services like the Associated Press cover up the murders of thousands of Americans by illegal aliens each year, or to schedule recorded interviews, please visit www.ALIPAC.us. Last edited by ALIPAC; 01-16-2019 at 12:23 PM. MW, GeorgiaPeach and imblest like this. Rep. Steve King of Iowa has been the top leader in Congress fighting against illegal immigration and Amnesty for many years. He has always done so in a non-racist and thoughtful way, but today he is under attack from the New York Times, leftist media, and pro-Amnesty Republicans! They are trying to force him out of office using lies and we need you to take the 4 steps below to defend King! Please take the following urgent steps. 1. Call these two scoundrels to demand they resign their leadership positions for joining Democrats at the New York Times to lie about Rep. King being racist. "I want GOP lawmakers to remove Reps Kevin McCarthy and Liz Cheney from their leadership positions for joining with the Democrats at the New York Times to make false accusations of racism against honorable Rep. Steve King who I support!" 3. Like, comment, and share the release meme below by email and on all social media platforms! 4. Read, understand, utilize, and share ALIPAC's Press Release (below + here) and use it to warn other while also sharing King's video (Here) and the Gateway Pundit article (Here). Engage the enemy everywhere you can and stand up for the truth and Rep. King! Beezer, Airbornesapper07, GeorgiaPeach and 1 others like this. Beezer, GeorgiaPeach and ALIPAC like this. Rep Jim Jordan needs to replace Rino McCarthy. How many time a day is McCarthy on the phone with Rino Ryan??? Airbornesapper07, GeorgiaPeach, ALIPAC and 1 others like this. Yesterday, upon hearing of Kevin McCarthy's actions against Congressman Steve King, I called McCarthy's offices to express displeasure and to request that those in Congress who used taxpayer dollars to cover up their alleged or confirmed abuse and sexual misdeeds should lose their committee posts. Calls of support for Steve King in this firestorm that he faces would undoubtedly be appreciated by him. Talking to the New York Times is always a danger for conservatives. Airbornesapper07, stoptheinvaders, ALIPAC and 1 others like this. Beezer, Airbornesapper07 and stoptheinvaders like this.